Trail #420 to #420C | 7 miles | 2328′ ele. gain | 5:15 hrs. What a strange week. 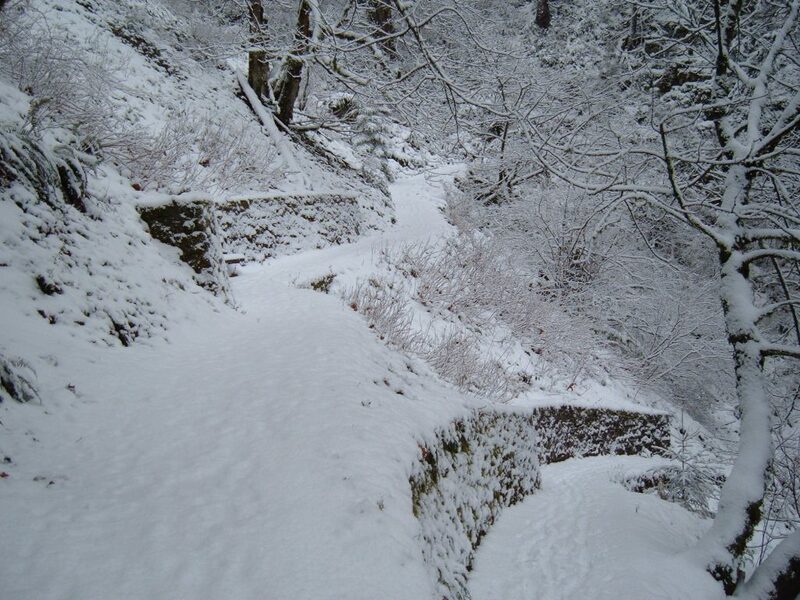 Snow in Portland, another storm on the way, and inevitably snow in the Gorge. Since school was closed all week I was able to take off this Friday, with the help of Brad in his burly truck, and go for a hike in the Gorge. At the Wahkeena Falls trail head there was about 2 inches of snow on the ground. We loaded our snowshoes on our packs, though we’d never actually use them. The snow helped pad the paved lower portion of the trail Soon we were at the falls, admiring the fringes of ice on the rocky wall surrounding the waterfall. We followed the switchbacks up and up. As we gained elevation, the snow depth increased. Snow fell gently through the trees as we trudged up the trail. Early in the hike we were treated to a viewpoint and caught a glimpse of the river. As we continued up the trail, we were greeted not by lush ferns and blossoming wildflowers, but icicles and snow-covered branches. This was not how I remembered the Gorge. 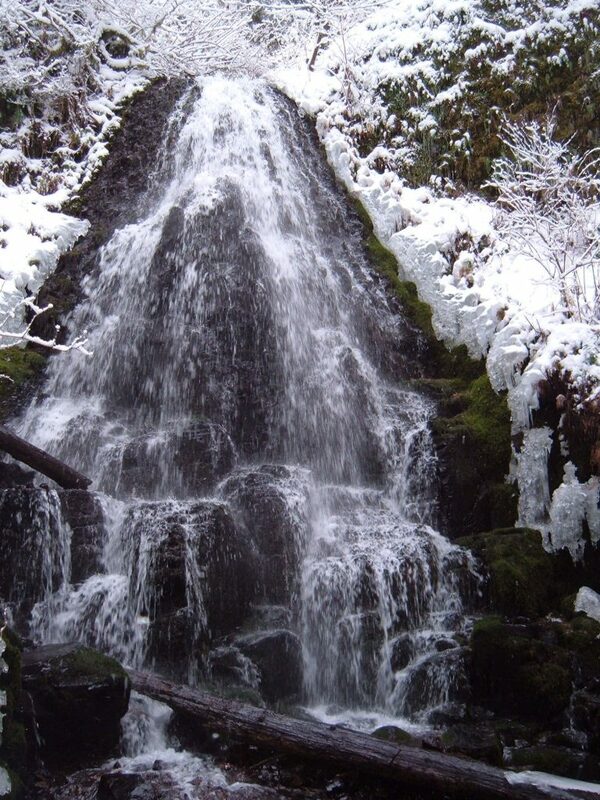 We stopped to look at Fairy Falls and soak in the scenery filled with gleaming white snow. We soon got a quick break from the climbing as the trail flattened out and met with the Devil’s Rest trail. Someone had been out here, maybe a day or two before. Snow-covered human tracks continued up the Devil’s Rest trail. The ascending continued for several more switchbacks. The forest got prettier and prettier. The trees shone with crystals of ice and snow reflecting the sparse sunlight As the trail began to level out again, we stole some more views of the river through the trees. The human tracks led us to a view point overlooking the river and then stopped. With the help of a GPS we negotiated our way to the summit of Devil’s Rest, marked by a plethora of colorful flagging and an official sign. Here, we ate lunch and tried to stay warm. Just as my hands began to freeze, we packed up and bombed back down the trail. Walking down through the snow is so much more fun than walking up. The snow helps cushion your footsteps and absorb some of the impact. The quick walking helped bring my body temperature back up and soon I was warm and cozy in the eighteen degree weather. 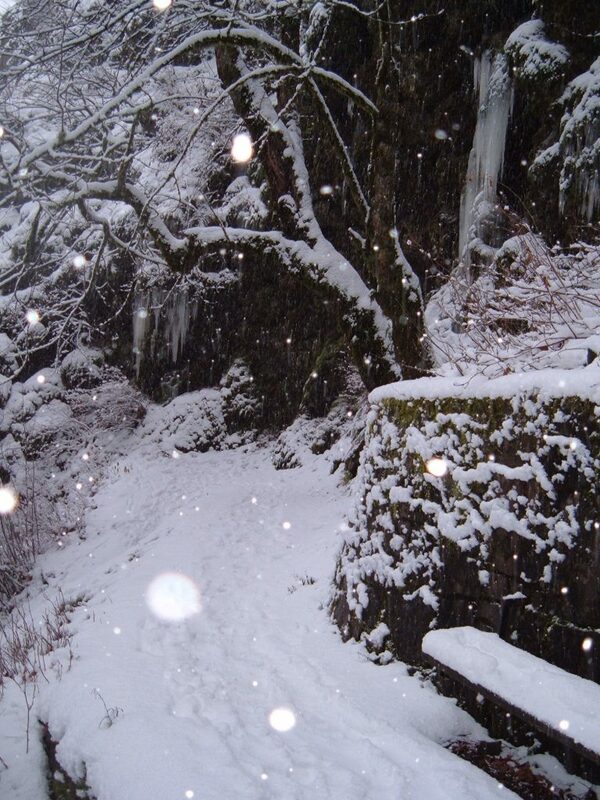 The snow continued to fall as we returned to the Wahkeena Trail. We noticed less than an inch of new snow since we had left up the trail this morning. As we approached the trail head we saw other human beings enjoying this lovely day. This entry was posted in Hiking, Oregon and tagged hike366 on December 19, 2008 by Jess B.